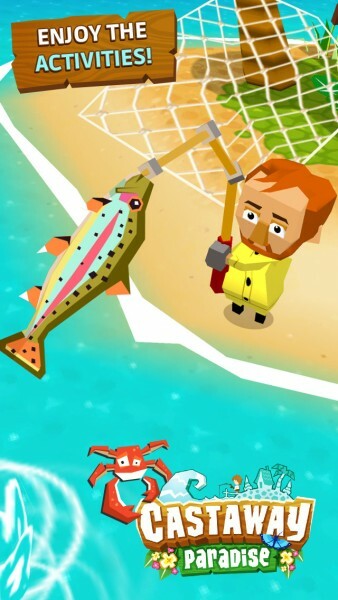 Castaway Paradise (Free) by Stolen Couch Games is like having Animal Crossing on your iPhone and iPad. If you haven’t had an opportunity to check out Animal Crossing: New Leaf yet, then Castaway Paradise is a nice substitute for the real thing. Last year, I made the mistake of getting ACNL. I say mistake because it sucked up hours of my time, and I became obsessed with checking on my village in regular intervals throughout the day, that is, if I wasn’t just on the game for half the day. It was an unhealthy obsession I tell you! I don’t know why I loved it either — I became attached to my village of cute animals, and I was always seeking my “dream town,” with rare or hard-to-get animal villagers. Then, by some kind of miracle, I was able to put my game down at some point last year, and I’ve never picked it up since. This is probably because I was afraid to find out which villager moved out, and then the chance for another to leave when I don’t check-in to the game again. I’m still afraid to check on my game now, but I miss it. Fortunately, Castaway Paradise is a nice replacement for the time being, and a great way for someone who has never played an AC game before to get a taste of what it is like — a gateway game, perhaps? The visuals in Castaway Paradise are beautiful and look great on the Retina HD screen of my iPhone 6. 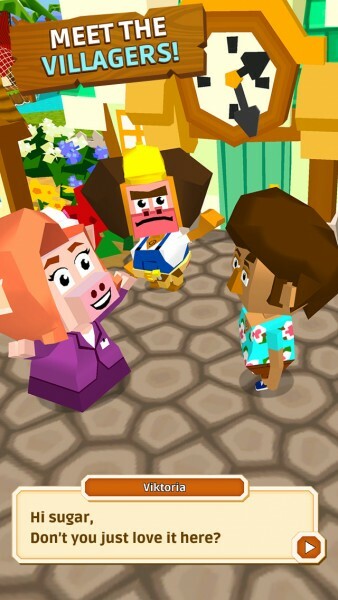 It’s not exactly like AC, as the characters are a bit more blocky, but the island is colorful, vibrant, and lush, which makes the game feel welcoming. 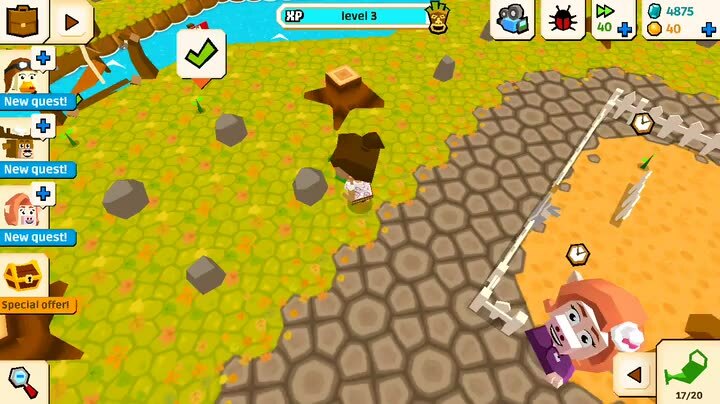 It’s all rendered in 3-D, and has smooth animations as you move around and explore or do various activities. The soundtrack is calming and relaxing, and the sound effects are fun. Just like AC, the dialogue is filled with jokes, humor, and charm. When you start your game, you will be a mysterious character covered in seaweed who has washed up on the shore of this island. 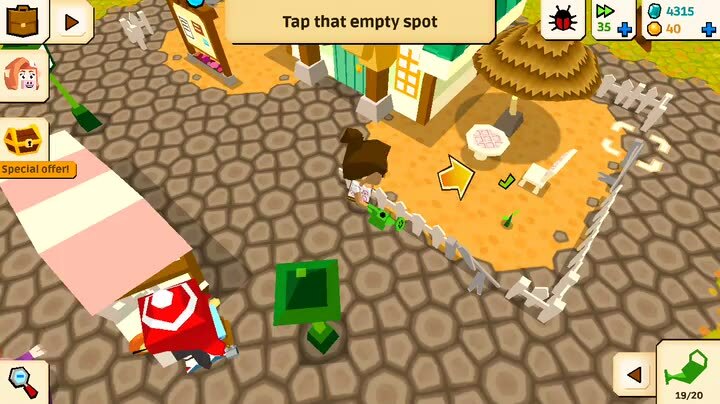 The mayor of the town helps you out by providing you a place to stay, but you will need to help out with various things on the island, of course. You can identify yourself as a boy or girl, which results in a randomly generated appearance based on your choice. 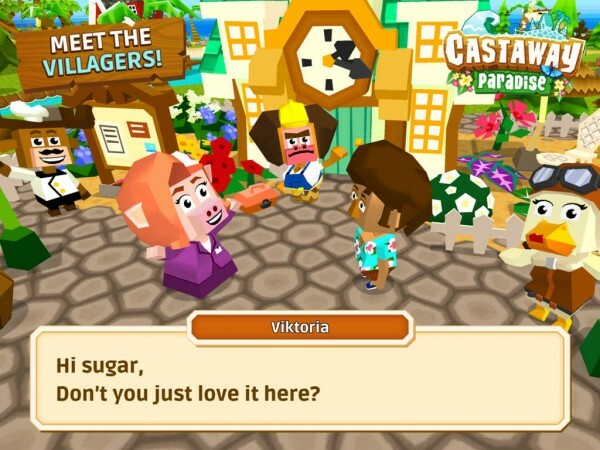 Castaway Paradise has different quests that other villagers will give you, which you can complete for rewards, so it’s not as easygoing as AC, where you’re in charge of the place. 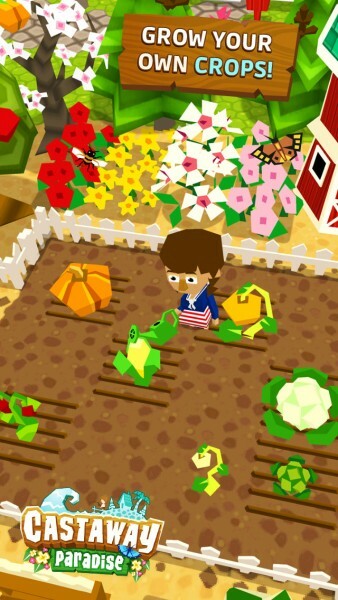 You can also interact with the environment, such as watering flowers and trees, picking up trash, selling crops and fish, and more to gain experience points. 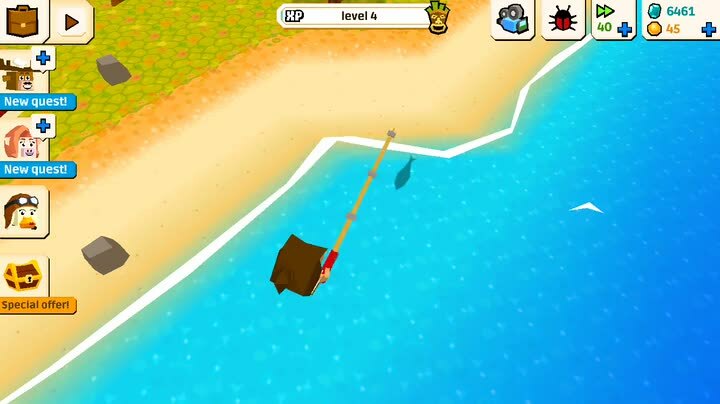 The more you level up in Castaway Paradise, the more activities you are able to do. The controls in the game are simple, though I believe that they could have made them better. To move around, just tap on where you want to go, or keep your finger on the screen to continuously move. When you come across an object that you can interact with, just tap on the buttons that appear above it. In the bottom right corner, you will have your arsenal of tools, such as a shovel, rake, fishing rod, and watering can. You can select them manually, or just use the interaction buttons to automatically pick the correct tool for the job. Personally, I wish the control for movement was a virtual joystick or something, because if I want to move upwards on the screen, my hand is going to be covering most of the game. It’s annoying to say the least, and I believe joysticks would have been much better for moving around. Hopefully the developer can change this in the future. You will start out with a basic tent to live in for a while, but eventually you will be able to build your own house on the island. 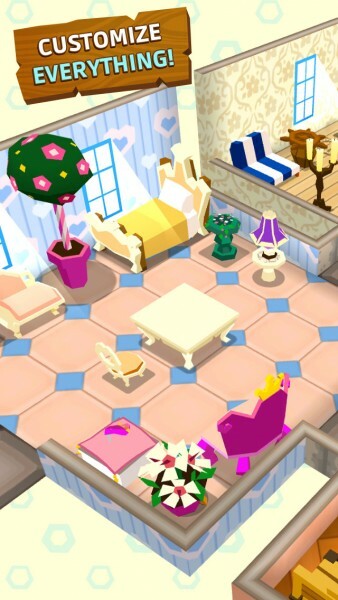 Just like the AC series, you can customize your house with various items and decor, your outfit can change as often as you want, and you can even set a theme for the island at some point. 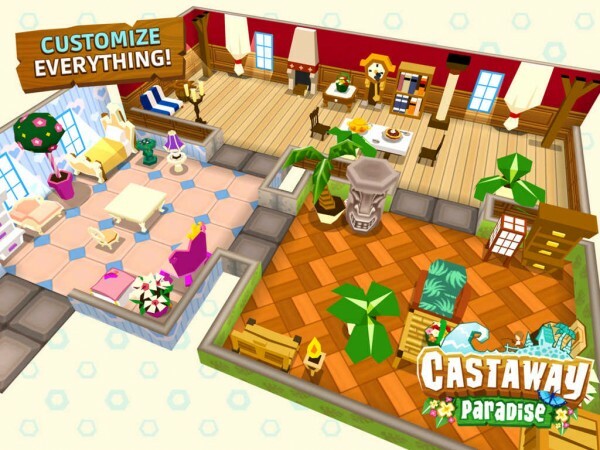 Games like this are all about customization, and Castaway Paradise is chock full of it. 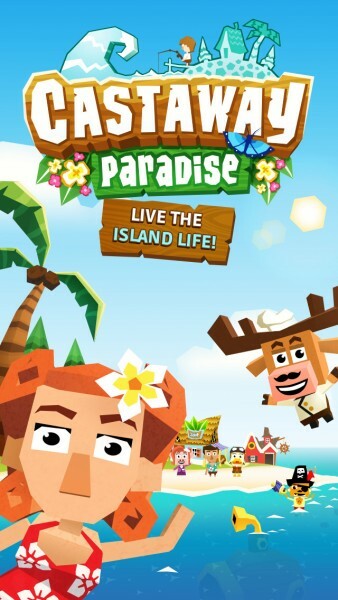 Unfortunately, as Castaway Paradise is a free game, there will be in-app purchases to speed up the timers and get premium currency to buy items. The game doesn’t force this upon players though, which is good, but you’ve been warned. Aside from the flaw with the controls, I’m enjoying Castaway Paradise so far. The graphics are beautiful, the music is soothing, humor is fun, and there is a lot of content to go through thanks to the various quests. Plus, who doesn’t love customization? This is a good way to get your fix of AC on mobile, and a nice introduction to these types of simulation games. 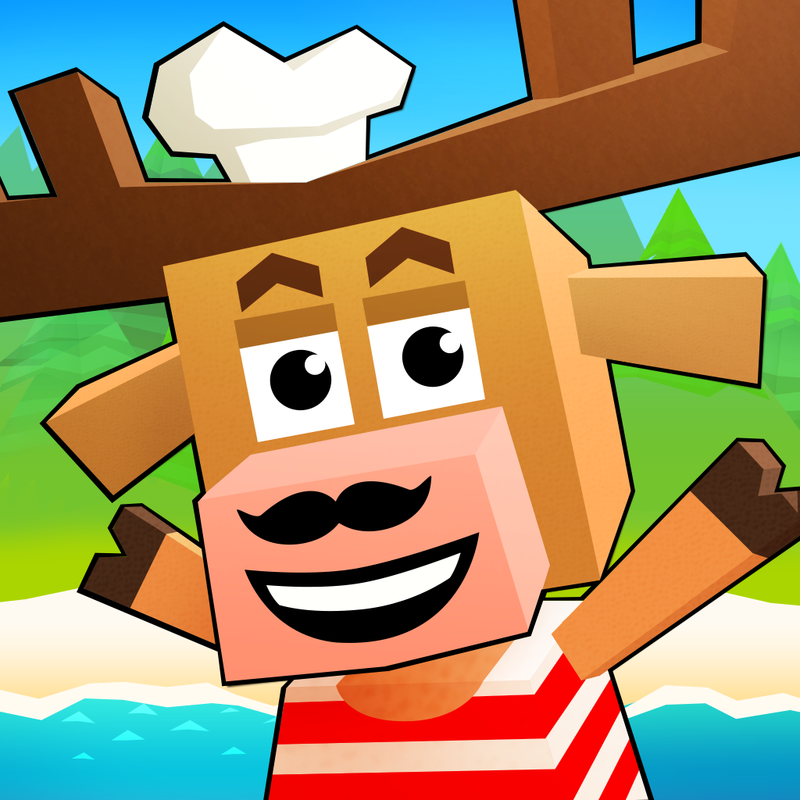 I recommend Castaway Paradise if you want a relaxing, tropical experience on your iPhone or iPad. 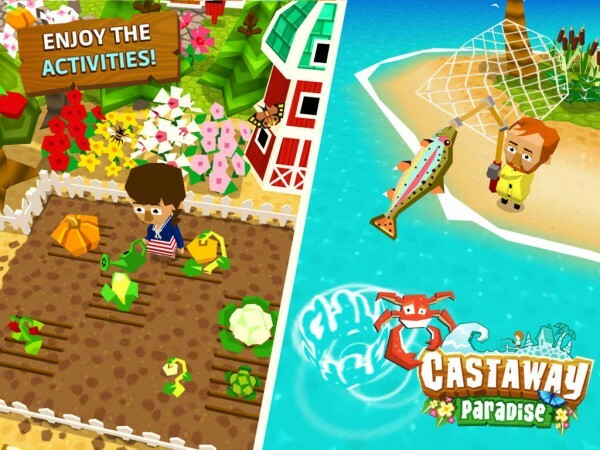 You can get Castaway Paradise on the App Store as a universal download for free with in-app purchases.